She sweeps the sidewalks bare. All swaddled up for fair. At sweeping what those long skirts swept. By the time of the publication of these lines, germ theory had pervaded every aspect of daily life in the Western world. Discovered in the latter half of the19th century, the theory, elaborated by scientists such as Louis Pasteur and Robert Koch, led to numerous changes in everyday living. A new exhibition at the Osler Library highlights one such example. Following the discovery of the Tuberculosis baterium, public health advocates rallied to create treatment and prevention programmes, including public health campaigns and anti-spitting legislation. They recognized the danger posed by tuberculosis-infected sputum on the streets swept up by the trailing skirts that fashionable women of the day favoured. Curated by Cynthia Tang, with rare books specialist Anna Dysert and costume curator Catherine Bradley, this exhibition explores the legitimacy that germ theory lent to the late 19th century movement to reform women’s dress, bringing together books, images, artifacts, and clothing pieces from collections across McGill. 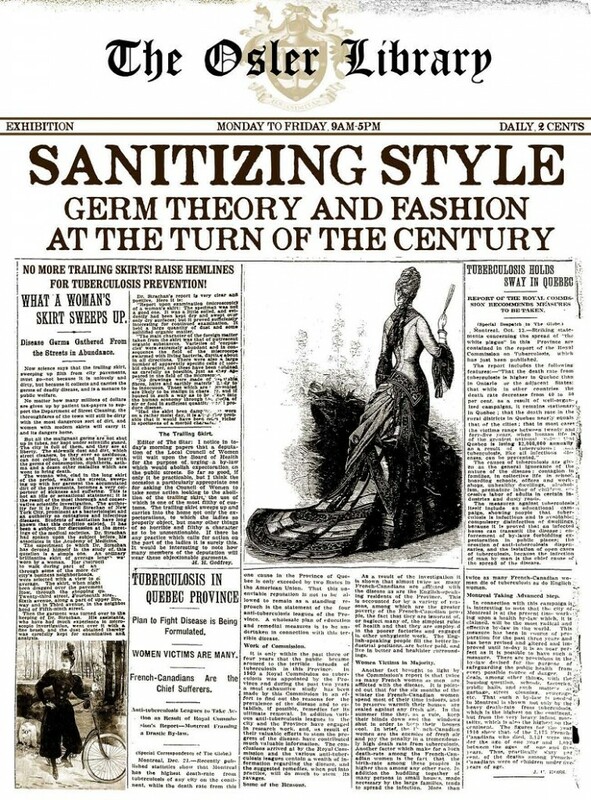 The exhibition Sanitizing Style: Germ Theory and Fashion at the Turn of the Century is on now at the Osler Library through November 2015. Stay tuned for a curator’s talk and exhibition walkthrough to be scheduled for October! This entry was posted in events & exhibits and tagged 19th century, dress reform, germ theory, public health, TB, tuberculosis, Victorian by Anna Dysert. Bookmark the permalink.